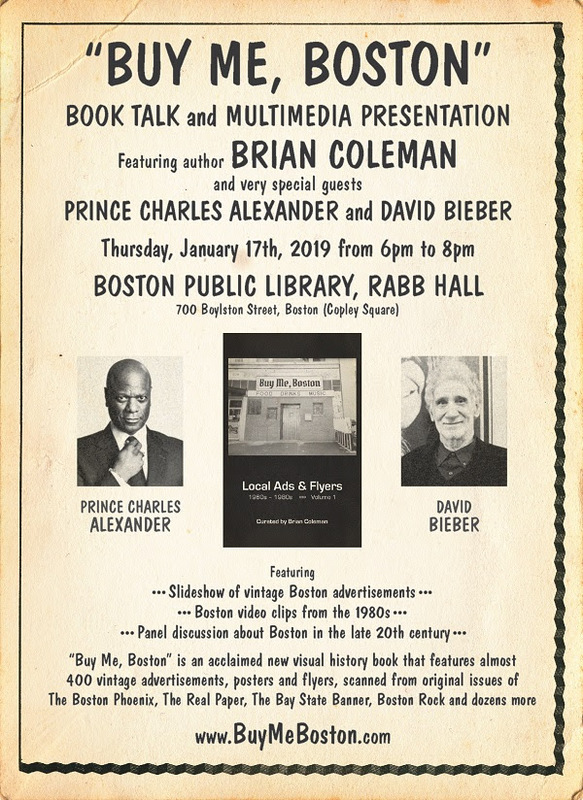 And very special guests: PRINCE CHARLES ALEXANDER, Boston-born Grammy-winning engineer, Berklee College of Music Professor and 70s-80s R & B musician; and renowned archivist DAVID BIEBER of the David Bieber Archives, formerly with WBCN, WFNX and the Boston Phoenix. Buy Me, Boston is an acclaimed new visual history book that features over 390 vintage advertisements, posters and flyers, scanned from original sources, including issues of The Boston Phoenix, The Real Paper, The Bay State Banner, Boston Rock and dozens more. For more information on the book, visit www.BuyMeBoston.com.